Complete your kitchen refurbishments with the ideal worktop edging. Find the prefect match among our worktop edging strip collection and eradicate any gaps that may be left once your worktop has been fitted. We stock kitchen worktop edging from high end manufacturers, including Artis, Encore, and WilsonArt. Our customers enjoy top quality worktop edging tape that can be easily matched to the worktops you select form our online store. We offer superb discounts throughout the entire kitchen worktop edging trim collection, with 55% off the recommended retail price of many of our kitchen worktop laminate edging trim options. Why pay more for the perfect match worktop edging strip when you can enjoy reduced price kitchen worktop edging from HC Supplies? We have worktop edging tape in all manner of styles including Encore Cinnamon, Pearl Grey, and Calico, Artis Night Ice, Angel Gloss, and Prima Antique, and several other kitchen worktop edging trim designs. When you purchase your new worktops from us, we will match the edging strips for kitchen worktops with your purchase when you select that option. Take a look at all our kitchen worktop laminate edging strip options to discover a bargain today! HC Supplies are known for providing superior quality products, including kitchen worktop edging strip, at amazingly low prices. You can take advantage of our massive reductions on every single one of our worktop edging strip rolls when you purchase yours with a new worktop. Did you forget to pick up a matching worktop edging strip the last time you visited us online? No problem, you can still benefit from our reduced priced kitchen worktop edging when buying the extra worktop edging tape you need today. Purchase the ideal water resistant kitchen worktop laminate edging strip from HC Supplies. If you aren't sure what type of kitchen worktop edging trim you require for your current worktop, get in touch and we will help you select the perfect trim from our huge collection of edging strips for kitchen worktops. As with all purchases from HC Supplies delivered to UK addresses, you can expect your items to arrive within 2 to 7 working days. You can arrange for your worktop edging trims to be delivered on a day that suits your schedule - just get in touch with our helpful customer services advisers who will organise everything for you. Do you require your purchases to be delivered overseas? We are pleased to be able to offer a safe and secure shipping service to homes outside the UK at very competitive prices. 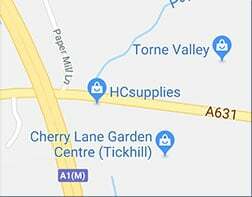 HC Supplies are delighted to be able to provide a design service to customers living within a 30 mile radius of their Doncaster store. Why not make your kitchen the best it can be by employing our dedicated and experienced design team to transform your kitchen? If you don't live in the area to take advantage of our full design package, you are welcome to pop in for some inspiration.